Today I joined some fellow bird banders to discuss what projects we have been participating in over the past year. This Banders Meeting was hosted by David Junkin, who you might remember as the individual who discovered the Junkin’s Warbler. It was great hearing directly from him about how he found what he called this “freak bird” and the following steps on how the world also discovered this bird. 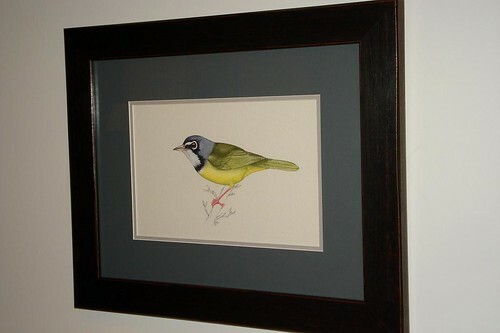 I was so pleased to have an opportunity to see the original Junkin’s Warbler Painting that was done for the publication “Living Bird”. 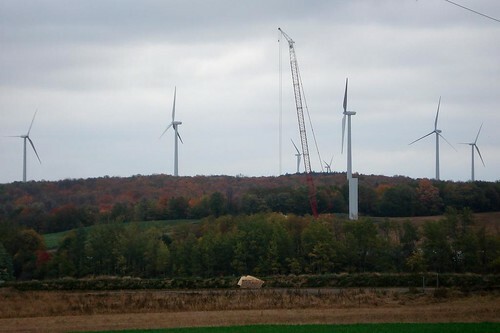 Construction of Wind Turbines in the area. From other banders from the area, we heard about some Kestrel Box Projects, Bluebird Projects, Hummingbird Banding, Braddock Bay Bird Observatory’s projects, banding in the National Forest, Egret Banding, Saw-whet Owls and many other bird related banding topics. An in-depth discussion was talked about regarding the construction of many Wind Turbines being placed in the area and how they will be impacting the birds! Ugg, don’t even get me started on this Wind Turbine subject! I will have to save this post for the winter months! It was wonderful seeing so many friends again and sure hope that I am able to attend next years meeting. This entry was posted on 20 October 2007 by mon@rch. It was filed under Bird Banding, Birds, Nature and was tagged with Banding, Junkin's Warbler, Meeting, Wind Turbines. i sure hope those wind turbines don’t chop up millions of birds. We are starting to see more and more wind farms in our area also. I’m torn on them also…..while it’s a clean and renewable energy source, I know how dangerous these turbines are for birds. Ugh, I know what you’re going to rant about with the wind energy. . . cell towers, too. . .
Ohhh, what a pretty painting! When I saw it on Flickr I thought it was a new one you had! Hey, did you mat/frame ‘The Big Scream’ yet? Just curious what it looks like when it is done! That is a beautiful painting. The colors are so vivid. Those wind turbines really wreck the views! I see the pros and cons on both sides. It’s a tough question. @ Ruthie – clean and renewable only when it’s windy! They use the not so green resources when they need to use coal, etc.. lucky we have energy coming from the falls which is just a good or better reliable green energy! @ Pam – ugg, cell phone towers are a different issue but ya! Will save that for a rant this winter! @ Erie – thanks and I see both sides also! But the more you learn about how these companies operate, locals get unexpected taxs, etc… they should be able to come up with something else . . . . but I have probably said too much since I don’t have any better recourse to supplement! @ Marg – ugg, tell me about it! Beautiful painting! I love seeing Kestrels, a very photogenic bird. 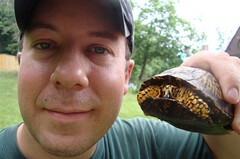 I was in your neck of the woods yesterday, spent the day at Allegany State Park with my hubby. Amazed at how much more color change there is in that area than here in WNY. Heading back there next weekend, will you be around? That is a wonderful Painting, you must have had a great time, must be pretty cool to discover a new bird! @ Kaz – it sure is and glad I had a chance to see it. I loved your wonderful photos on your site! I posted a link in my next post! @ Bernie – thanks and it was a great meeting! There must be sources of alternative energy that won’t turn birds into avian cole slaw. I commented on the original post, but that’s pretty amazing. And that drawing is fantastic.